« March 1-3, 2013: Grease is the Word! Next month, we’ll be hitting the road for the East Coast. This will be mine & Pat’s final trip east for a while. For the past few years while my daughter’s been in school, I’ve been taking her and my grandson east to visit family, but with this being her final year of school, next year, she can venture out on her own if she likes. Pat and I will thereafter be focusing our attention on pretty much every other direction of the country. We’ve talked about places we wanted to visit, like South Dakota (Mt. Rushmore), some National Parks, like Bryce Canyon, Zion, etc. Another 66 trip would be great, and in a couple of years, we’d like to do 66 with our grandson and go to Disneyland (most specifically, Cars Land). But back to the current trip. We’ll be pretty much slabbing on the Evil I to Connecticut on Friday and Saturday, likely from I-70 to Columbus, then I-71 to I-80 and 81 to 84. could do that in my sleep, which isn’t hard to do, given how awfully boring that route is. I prefer the southern route, but not feeling like paying tolls with two cars! From Sunday through Tuesday or Wednesday, Pat and I will be venturing from Connecticut for a drive through western Connecticut on US 7, north into Massachusetts and Vermont. I’d like to visit a diner a coworker recommended called the Blue Benn Diner, which is said to have really good “crunchberry pancakes.” That sounds good to me! We might take a bit of a route called the Molly Stark Trail, then after Bennington, head to a favorite vacation spot from my teen years, Lake George, NY. I haven’t been there since the early 80’s, when Gaslight Village was open. I remember the Cavalcade of Cars exhibit was pretty cool, featuring the Munster Koach, Chitty Chitty Bang Bang, Bob Hope’s golf cart, and loads of other famous cars (I think it had some of custom George Barris cars too). I always enjoyed the area, so it’ll be fun to head back there for a day or so. Wednesday I’ll be catching up with friends, and Thursday – Saturday, we’ll venture to southeast Connecticut/Mystic/Rhode Island, then start heading back to Indiana on Saturday. Other than having a basic route to follow, nothing is planned. Timing, lodging, dining, nothing! I have some notes on things that we might enjoy doing, but otherwise, I’ll simply have my iPhone handy and search for what we want to do on the fly without strict plans in place. I definitely like having a general plan, a little information handy and definitely having Internet access available to help find things when we arrive someplace. But overall, I much prefer to “wing it” rather than be strict and methodical on most of our trips. The irony of that is that I am very organized and methodical in my life and job. If we’re going to do filming locations or really want to see specific things or are in a place where we feel more comfortable with a plan, we will – but just letting things unfold is far more fun and exciting! For this trip and future ones, I’m planning on posting trip logs and photos faster, hopefully nightly. With my new Sony NEX-6 and iPad Mini, I have a workflow in place that I will be “road testing,” as well as recording the trip using the Trimble Outdoors Navigator iPhone app. As I said earlier, I used the Trimble website plus their My Topo app to plan the route, and the iPhone app will track where we travel, helping me to geotag my photos on my iPad Mini. 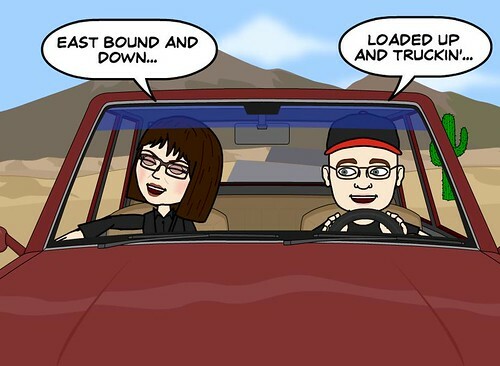 This entry was posted by Jennifer on April 25, 2013 at 2:29 pm, and is filed under Road Trips. Follow any responses to this post through RSS 2.0.You can leave a response or trackback from your own site.